Dr Annuar carrying out the screening on a patient using the echo-cardiography machine, as medical assistant Abdul Wahid Putit looks on. 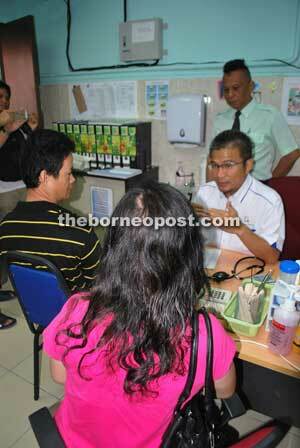 SIBU: Over 500 patients are on the waiting list of the cardiovascular risk-screening programme under the Health Ministry. 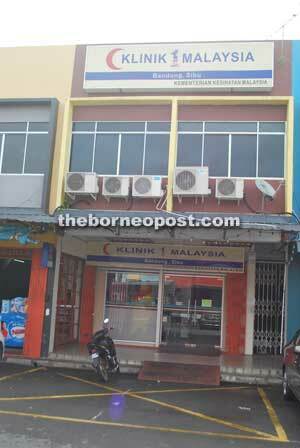 Project initiator Dr Annuar Rapa’ee said owing to overwhelming response to the free heart clinic – which kicked off at 1Malaysia Clinic (K1M) in Bandong Road here yesterday – its frequency would be increased next month. “Over 500 people have registered for the programme. So, I will increase the number of days (of seeing the patients) to, perhaps, twice from the current once a week. “I am also hoping to see more patients – maybe about 20 daily,” the UK-trained cardiologist told The Borneo Post here, adding that he provided consultation to five patients yesterday. 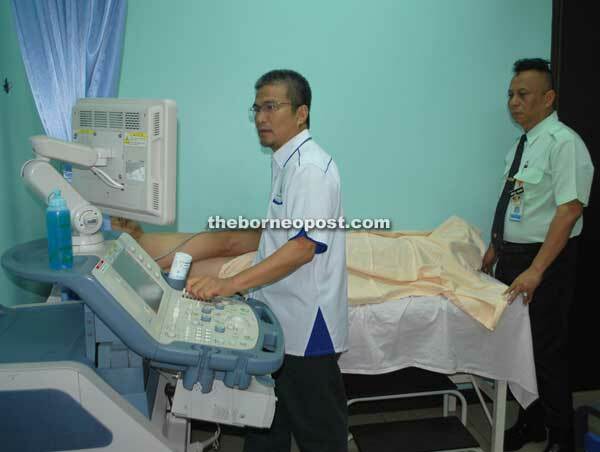 According to him, the K1M Bandong is the first and only one in the country to be equipped with the state-of-the-art echocardiography machine that runs the screening. On the programme, Dr Annuar – who is also Nangka assemblyman – said patients would only need to make appointment and pay RM1 (free for senior citizens) for the service, which would include full consultation on cardiovascular diseases (CD). Such service would have easily cost over RM1,000 if sought elsewhere, he added. Explaining further, he said a patient would be screened to determine if he or she had symptoms of heart disease and the possibility of contracting it within a span of 10 years. Set up last year, the clinic receives 1,200 patients every month. “The risk factors such as fasting blood sugar, fasting lipid (cholesterol), as well as body weight and height, which gave rise to the Body Mass Index (BMI) would be assessed. “We will also measure your waist-to-hip ratio, blood pressure and diabetics. Physically, we will conduct assessment in relation to heart disease, including investigation using the echocardiography machine and electrocardiogram (ECG),” he said, adding that it would be better if patients could bring along previous results of their fasting blood sugar and fasting cholesterol – if any – to the screening. At the end of examination, he added, patients would be advised on steps to reduce the risks of having a heart attack. Notably, Dr Annuar pointed out that under the screening, no medication had ever been dispensed. 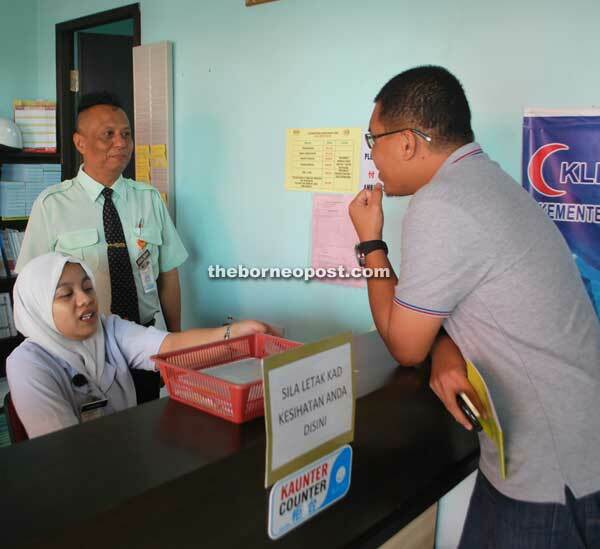 “Those suspected of having heart disease would either be referred to Sibu Hospital or the Heart Specialist Centre of Sarawak General Hospital,” he said, adding that he would make referrals for patients seeking further treatment. For better monitoring, he said each patient would be given a Cardiovascular Risk Awareness Card that they could carry anywhere. On a related note, He also noted that CD cases had been on the rise these days, mainly associated with people’s lifestyle. On this note also, Dr Annuar reminded all that heart attack remained the No. 1 killer in the country. Meanwhile the K1M Bandong, which was set up last year, caters for some 15,000 folk in the Nangka state constituency, with an average monthly attendance of 1,200 patients. It is open from 9am to 9pm daily. K1M Bandong staff ready to serve. Dr Annuar, a UK-trained cardiologist, providing consultation to patients.